As I continue my research into the impact of Dialogue on organisational change, it is clear that when we talk about Dialogue we don’t always mean the same thing. Apart from the obvious use of dialogue to describe any conversation in a book, a play or a film; we often hear the word used to describe conversations to resolve international conflicts -UN ‘peace dialogues’ for example. Even in the field of organisational change the word Dialogue means different things to different people, so I thought it might be interesting to share some of the definitions I have come across. What conditions enable effective conversations at work? Whether they are strategic conversations in the boardroom or conversations between front-line team members, two things matter: a conducive environment and well-developed skills. The Right Conversation’s Spotlight on Dialogue, research report identified four necessary conditions and three essential skills for dialogue to take place. Over the past year I’ve been researching the impact of using Dialogue for organisational change, both in the published literature and in conversation with people working with dialogue in the public sector. How do we know that dialogue is an effective way of generating effective change in organisations and individuals? Given that there is general agreement that conversation matters – what are leaders doing to develop the skills of dialogue in their organisations? The National Dialogue Community of Practice (DCoP) met and had a productive session on the 15 November at the COSLA Conference Centre, Edinburgh. Sharon Millar, Principal Lead Organisational and Leadership Development at NHS Education for Scotland, opened the session, reviewing the DCoP journey so far and the recent evaluation carried out by Marie Laidig from Insight Expedition. See Sharon’s insights on the session below. Our Steering Group Needs You! At the session, we decided to form a steering group of between 8-10 members of the DCoP to keep the drive for dialogue to support people through system wide transformation of public services. Read the latest Dialogue Newsletter now! 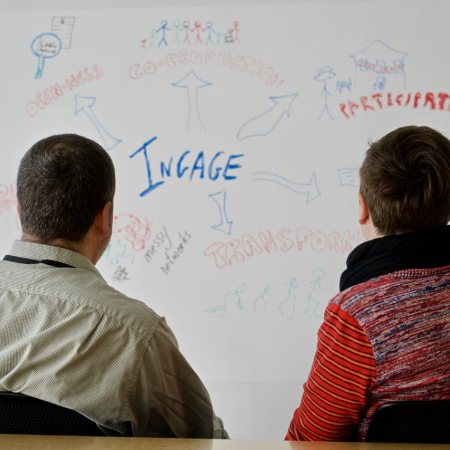 Read the latest Dialogue Community of Practice newsletter now! To register for the January masterclass, please click here.